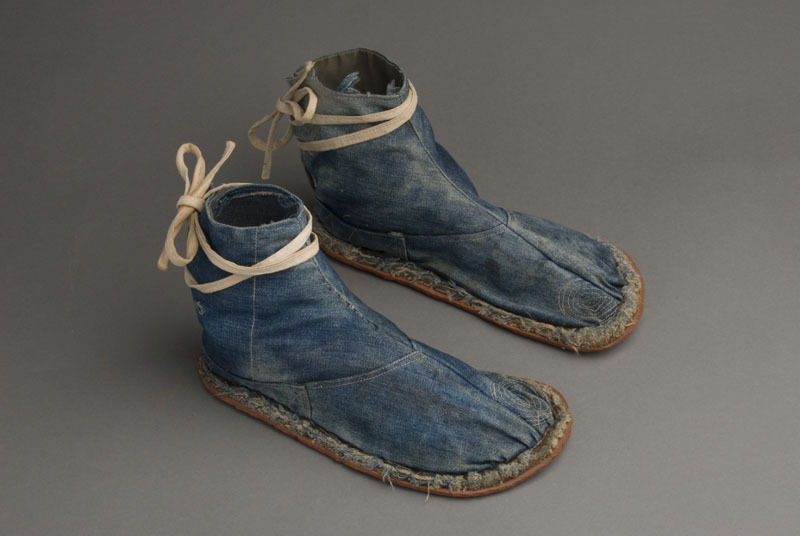 1 pair of jika-tabi (Japanese style socks intended for outdoor use) : denim, rubber, cotton ; each, 10.5 x 4.25 x 5.5 in. Blue denim jika-tabi with brown rubber soles, split toe front and decorative circular stitching on toe and zigzag stitching around heel; sole lined with denim, small patch of olive green cotton fabric on one side. Denim fabric covers ankles, overlapping slightly in back, and is secured with natural fabric ties; attached to rubber sole with bracket nails. There are four layers of rubber on the sole. Haruno Tazawa first used conveyor belt scraps from the sugar mill for the soles and later used automobile tire inner tubes. The toe is reinforced since it tears first.